Minsk – More than half of Belarus’ 9.5 million people use the global messenger service Viber, which was created in Minsk more than seven years ago, to quickly exchange messages, receive information, and make phone calls at home and abroad. Now, a new IOM Belarus Viber community has been established to share travel information and inform people about the potential risks they face, including human trafficking. IOM Belarus and Viber signed the partnership agreement on 30 July, symbolically launching the new relationship on World Day Against Trafficking in Persons, to disseminate information and tips about safe migration. The partnership involves the creation of an IOM Belarus Viber community and the development of promotional activities to reach the target audience. 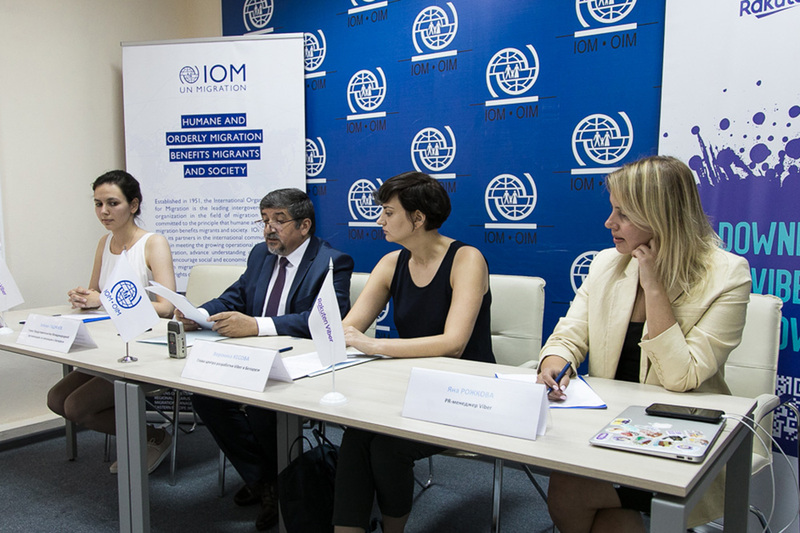 "The partnership with Viber will be a significant contribution to preventing human trafficking in Belarus," said IOM Belarus Chief of Mission Zeynal Hajiyev. The community is expected to help reach people who don’t feel comfortable calling hotlines and telling operators their problems. According to the hotline statistics, women call the hotline more often, suggesting that men may not feel comfortable receiving consultations in this manner. Join the IOM Belarus Viber community: https://vb.me/iombelarus.